Well our summer is off to a great start. Our memorial day weekend was uneventful. We mostly stayed around home and got things done and relaxed. The end of school nearly did us all in and we just needed to relax. We did walk over to the square on Saturday and walk around the splash park and then we ate at our favorite pizza truck. 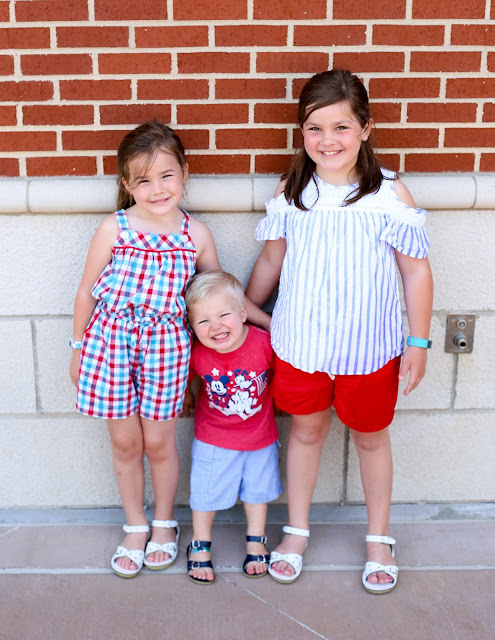 There is not much I love more than kids in red, white and blue clothes. We have been eating a lot of popsicles and playing outside. Scott went back to work Tuesday and our real summer began. It's actually been a really good week. The girls have slept in every morning so our mornings have been so nice and relaxed and not rushed! Will Holden has been taking long naps and I've been able to catch up a lot on laundry. It's nice not to have to go a million places every day. Instead we go to the park and play outside a ton. This is the first summer we have had that is long since we used to be in year round school. So twelve weeks sounded like forever but I think it will go fast. We are going to enjoy it! Walmart had their annual shareholder meeting in our town last week which means busses and busses of international employees and employees from all over the nation in town. It's a big week for our town. The kids and I headed to the square for first friday and to see what was happening. We have had a really good first week of summer. It's been so nice - kids sleeping late, lazy breakfasts, long naps for Will Holden and a lot of outside time. But the sister fighting has been off the charts. So I may have possibly lost it a little soon after this sweet summer snow cones on the square picture was taken. 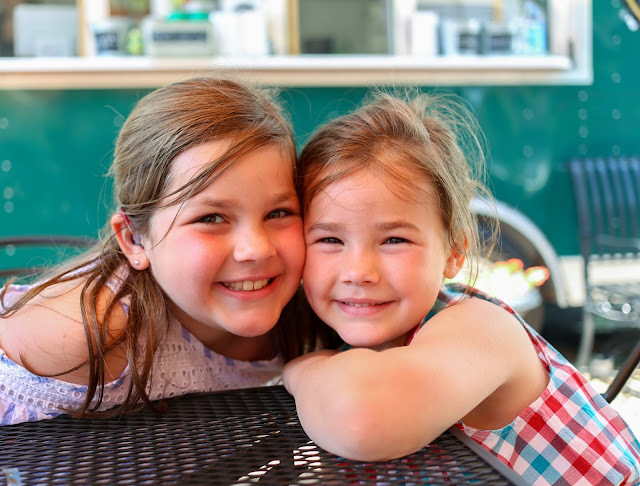 They started fighting and I made them throw out their snow cones and leave and maybe said we wouldn't be doing anything fun this summer plus took a few things away. And yelled a lot. We are home and have had a good talk. But sometimes it's good to know the real stories behind the cute pictures. Because real motherhood is not all ruffled shorts and sweet smiles. It's messy and humbling. Thankfully the girls quit fighting on Saturday and since they lost all access to screens - they actually PlAYED! They put on makeup and told me they were playing "high school". 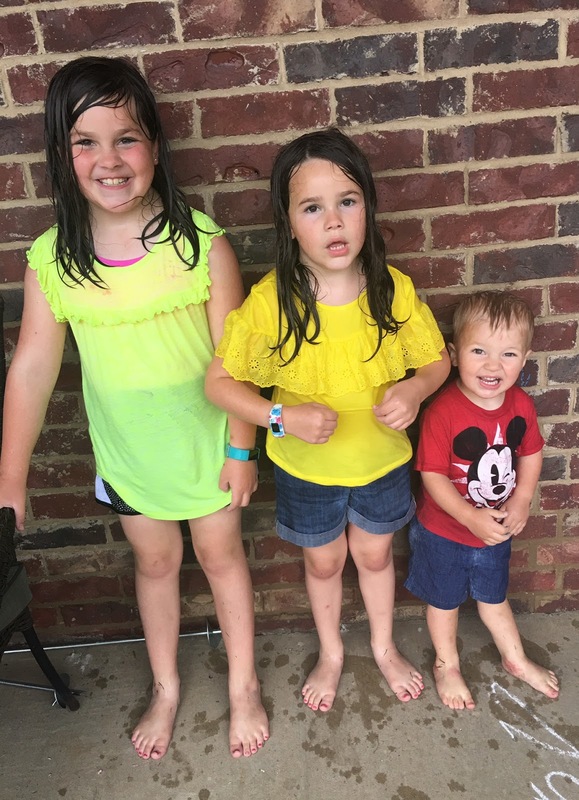 And then it started pouring rain and the kids just ran around in the yard for an hour in the rain. They had so much fun. I was so glad we were just home with nothing to do. I love just the simple joys of childhood! Today we had church and then Harper had a birthday party to go to. It's been a good weekend. It's been a good start to summer.